Just like the hundreds of different tips to improve your golf game there is an equal number of tips and tricks for grilling food! I’d like to share some basic “must do’s” when you fire up the grill this summer. Whether you use propane or charcoal, the basics of “how to” will not change. 1) Keep your Grill Clean. Always use a grill brush before and after cooking to clean the grill. For your best results when cleaning, make sure the grates are hot. 2) Keep the grates of your grill well oiled. Again, I like the “before and after” thought on this subject. The grill is hot and clean so apply a light coat of salad oil to the grates, this will help keep your grill in good shape and ready to cook when you are. 3) When you fire up your grill to start cooking, let it get hot, the hotter the better, but do keep a cooler zone that you can move your food to in order to ensure your food items are cooked thru. 4) Don’t be an impatient cook, take your time and enjoy the smoke. Give yourself plenty of time for the items you have chosen to cook. 5) Your mother told you not play with you food, so don’t when you are grilling! 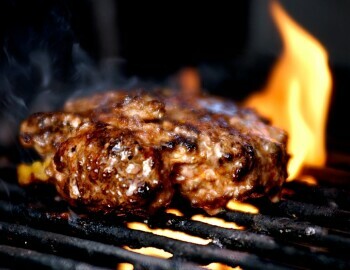 Your food items should, for the most part, never be moved once on the grill, and not more than four times in general. This will allow for those great diamond marks while helping to keep your foods intact. 6) “Flare-ups” will happen so keep a squirt bottle of water handy to keep them under control. If you have any specific questions and happen to see me around the Club, feel free to ask! I would love the opportunity to help you master one of my true summertime pleasures.